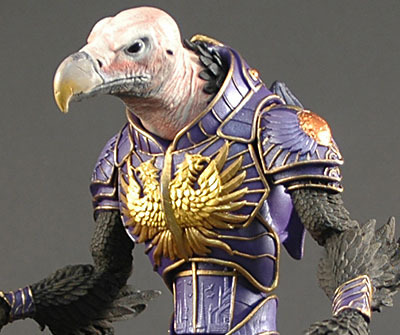 In the beginning, I foolishly told myself I was only going to get two figures from the Four Horsemen's Gothitropolis Ravens Kickstarter: the Black Raven (Decimus Hrabban) and the Vulture, aka Vultus. I didn't hold to that, and I ultimately ended up with seven birds. But still, it was Vultus I was anticipating the most. I have a thing for birds of prey, and vultures most of all, so Vultus definitely hit me in the right spot. Sculpturally, he's identical to Decimus and the other birds, save for his head. It's difficult to say with absolute certainty which species of vulture the 4H was using as a reference when they sculpted Vultus, but I'm 99.9% sure he's based on the Lappet-faced Vulture (Torgos tracheliotos), an Old World Vulture native to Africa and the Arabian Peninsula. The huge beak and color pattern both seem to match well. Quick OAFEnet Fun Fact: Old World Vultures of Europe, Asia and Africa are only superficially related to the New World Vultures of North, Central and South America. Their similarities are due to convergent evolution, and though they share a lot of the same features and habits, there are some pretty significant differences between the two. For example, OWVs hunt by sight, while NWVs hunt by smell. So anyways, Vultus. The Lappet-faced Vulture is a nice, solid "standard" vulture base, thanks to its massive beak and bald head, there's really no confusion as to what kind of bird this is. The head sculpt is quite good, with a scratched, pitted beak and a wrinkly, creased skin texture. There are even some little feathers poking out just at the base of the neck. The rest of the sculpt - the armor detail, the exposed feathers, the reptilian scaled feet - is exquisite, but you can read all about that over at the review of Decimus. Less exquisite is the paint. Oh, the body is quite nice. The feathers are nice, matte and dark, and the feet look great. The armor and outfit are swimming in color: mainly a metallic purple with two different shades of gold to accentuate it, along with a few splashes of copper. It's not perfect, and there's some bleed, but given how complex the paint apps are I'm willing to forgive. The head, though, is another story. I'm not exactly sure what happened here, but it differs quite strikingly from the prototype. On the prototype, the different shades of pinks and browns on the naked head all blended together very subtly and naturally. The actual figure does a very poor job of replicating this. The red wash stands out very starkly from the dull tan of the head, and the dark gray-brown on the chin ends up looking like Homer Simpson stubble, with a very sharp and clean line separating it from the other colors. They eyes are a flat, dull, lifeless black, ringed with a too-sharp, too-clean line of bright white, and the beak gets a big old ugly splotch of black right on top. You typically expect the level of quality to drop a few levels from a hand-painted prototype to a mass-market figure. However, these aren't mass-market figures. They were a very limited release, and the cost per figure was not inexpensive. I expected more. It doesn't ruin the figure, but it is something of a letdown, especially considering that the rest of the figure, below the head, has a damn fine paint job. While I don't hate him by any means, he's definitely not my favorite figure in the series, as I originally expected he'd be. The articulation is exactly the same as Decimus Hrabban, and it works great, once you get all the joints moving. The 4H sent everybody who ordered on Kickstarter a message after the figures went out, saying that the joints would probably need some freeing up before they moved. They recommended a hair dryer; I used a freezer. I finally got all the joints on my Vultus to move, though a couple of other figures aren't so lucky, featuring stuck thighs. They aren't broken, but I've tested them as far as I'm comfortable with. Still, there are a lot of fun poses to be had and most of the joints move nice and smoothly. 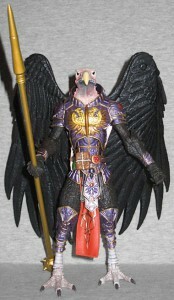 Like Decimus and the other figures in this series, Vultus gets the fake armor mini-wings that can pop off. The Kickstarter campaign offered a set of black wings that fit with Vultus (shown in the main picture above), but I didn't personally opt for them, preferring another option which fit uniquely well with the carrion-eating aspect of the vulture's nature (which will be discussed in a future review - ooh, foreshadowing!). He also gets the same interchangeable feet (grasping and curled for flight) as the other birds, painted in pale gray, and a golden spear that utilizes the same sculpt as the non-raven birds. I'm definitely a bit let down by Vultus, but I still like him a lot. As much as I wish he was closer to the prototype, I can only complain so much about being able to add an awesome vulturine warrior to my display.